The first wing of the Blackrock Mountain adventure for Hearthstone has arrived. Blackrock Depths has three new bosses, two new class challenges, and plenty of new cards to collect. This guide will take you through all the challenges and how to dominate them. Once you own a wing, you’ll be able to fight the bosses within as many times as you like and the cards are as good as yours. However, there can be a lot of trial and error involved. Now you can breeze through them with surefire tactics that will get all of the new cards into your collection immediately. First stop is the Grim Guzzler for a bar fight with Coren Direbrew and his crew of Dark Iron Dwarves. Be careful as it looks like everything from Succubus to Venture Co. Mercenary has stopped in for a drink. Coren’s hero power is Pile On and will automatically use it to summon a random minion from the deck to the board both for himself and for you. You can easily use this to your advantage by loading your deck with the biggest minions you own and damage-dealing spells to control the board. Druid is easily your best option at building a powerful deck. Massive minions like Boulderfist Ogre, Force Tank MAX, and Ironbark Protector will rule the board once summoned, but you should also keep a couple Chillwind Yetis that can be played on their own once drawn. Anything smaller will just put you behind. Damaging spells like Wrath, Starfire and Starfall will help you bring down Coren’s buddies, but you should also run Innervate and Wild Growth to keep your mana high and prevent your hand from filling up with costly minions you can’t play. The one thing you want to cautious about is that Coren has the Brawl spell, which kills all but one minion on the board, and his exclusive Dark Iron Bouncer automatically wins this otherwise random outcome. Be careful against flooding the board and losing too many minions to Brawl. Follow these guidelines and the Grim Patron card will be yours. Your next challenge is the Dark Iron Arena with High Justice Grimstone. His hero power, Jeering Crowd, summons a 1/1 with taunt for only 1 mana and his deck is filled entirely with legendary minions. That sounds scary, but legendaries are generally slow and he’ll often be stuck without a play for the first few turns. An aggressive Hunter deck with low cost minions like Knife Juggler and Abusive Sergeant should kill him faster than he can bring out his nastiest fighters. Spells like Freezing Trap and Deadly Shot will help you keep up if he does manage to bring out anything troublesome. It’s a fun encounter, but not especially difficult. The Rogue’s new Gang Up spell awaits you at the end of the arena. The last boss fight with the Dark Iron Emperor is undoubtedly the most intimidating. Emperor Thaurissan’s hero power deals 30 damage for only 2 mana, meaning he can kill you in one turn with ease. Fortunately, he starts the battle with Moira Bronzebeard on his side of the board and she prevents him from using his hero power and cannot attack minions unless they have taunt. Obviously, you need to keep her alive to stop Thaurissan from instantly destroying you. As a result, your deck shouldn’t contain any AoE or strong taunt minions that could kill her. Small taunts like Annoy-o-Tron and Mirror Image can be useful, but anything bigger is too risky. Your biggest concern is Thaurissan’s own AoE effects with cards like Unstable Ghoul, Death’s Bite, and Abomination. Silence and freezing effects combined with a cast of mostly small, aggressive minions in a Mage deck will make for a strong build for bringing the emperor down. Thaurissan is armed with many cheap imps to flood the board, so you’ll need to keep up with his early game without risking Moira going down. Your prizes will be the Priest’s Resurrect and Emperor Thaurissan’s legendary card. Starting off the class challenges is the Hunter challenge against Coren. 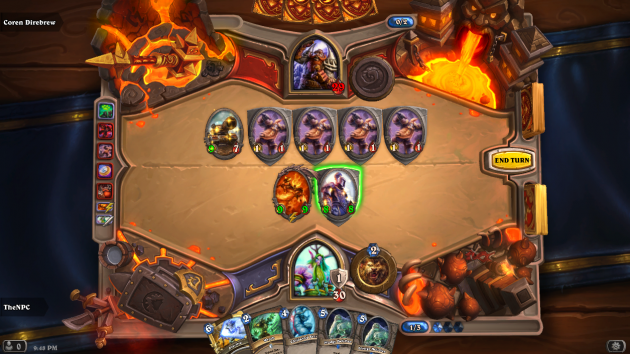 Coren still has the same deck as the boss fight, but your deck will be premade for you with an emphasis on beasts. I wish I could give you strategy for this one, but it mostly comes down to the luck of the draw with the Pile On effect. The best advice I can give you is to hang onto spells and cheap minions with your opening hand. Hanging on to the Houndmaster in your starting hand may be a good idea as well as its battlecry won’t trigger if it’s summoned from the deck. It will probably take you a couple of attempts, but intelligent plays will get you through. The fearsome Quick Shot spell waits at the end of the brawl. The Mage class challenge pits you against Grimstone armed only with a deck of thirty Unstable Portal spells. The 2-mana spell will put a random minion card into your hand with a 3 mana discount included and it could be any collectible minion in the entire game. This challenge is even more unpredictable and your success will be based entirely around the cards you get. Strategy is essentially impossible and you’ll just have to make the most of what you get. This challenge is definitely a joke, but at least it can only delay your journey to getting new cards. Keep at it and you’ll win the Dragon’s Breath spell for Mage and complete your collection for this wing. Finally, we have the heroic challenges. There are no cards to earn with the heroic challenges, just an exclusive card back once you’ve beaten everyone in Blackrock Mountain. These are intended as an extra challenge for expert players and can be skipped without concern. Each of these will be extremely difficult, even with optimized decks. Coren will start the battle with 15 armor and his hero power summons two minions from his deck and only one for you. It’s very easy for the game to spiral out of control with the number of large minions that he’ll call in. Your best bet is to build a Mage deck with the same large minions you brought to the boss fight and a variety of spells with freezing effects. Spells like Frost Nova and Blizzard will let you seize control of the tempo of the game. You’ll probably need a few legendaries to really stand a chance and it may take you a few attempts, but he can go down fairly easily. 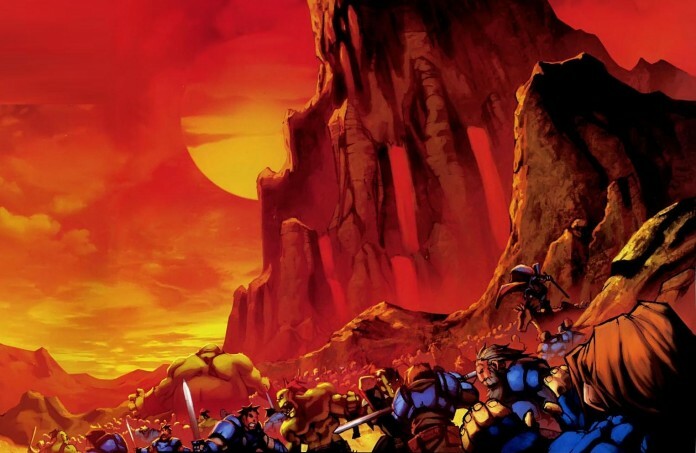 Grimstone’s heroic challenge is where things get insane. Not only does he start with 15 armor and his hero power is now free, he also starts the match with 4 mana on his first turn. Sadly, for those of you playing on a budget, there’s no way of getting through this one without a few epics and legendaries of your own to keep up with his incredibly powerful plays. Again, the Heroic challenges are meant more for seasoned players than those just starting out. 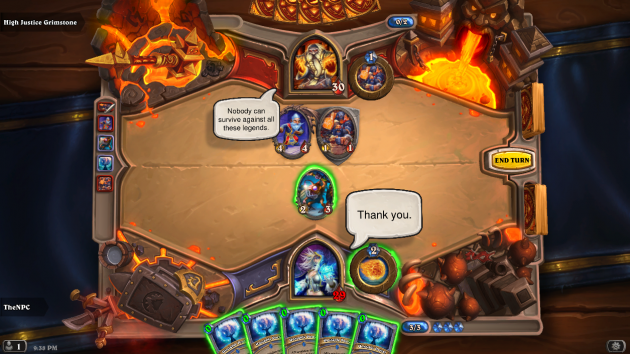 Freeze Mage, a popular deck utilizing cards like Frost Nova, Doomsayer, and Mirror Entity, is a pretty strong method of taking on the legends of the arena. Legendaries like Alexstrasza and Archmage Antonidas are going to be important for dealing the final blow. Finally, Thaurissan’s heroic challenge starts him with 15 armor (seems to be a theme with these dwarves) and Moira is a 3/1 instead of a 1/3. Again, AoE is unusable as protecting Moira is top-priority. Your best bet will probably be a Priest deck armed with Crazed Alchemist that can buff and heal Moira. However, Alexstrasza may be needed for this strategy to get Thaurissan’s health low enough to beat him. That wraps it up for this wing of Blackrock Mountain. Let us know what your favorite encounters and cards were for this set and what you’re looking forward to in the next wing. Previous articleA New Challenger Approaches!